Common comfrey (Symphytum officinale): growing, planting, caring. Comfrey is an important plant in organic gardening, used as a fertilizer. Symphytum officinale - common comfrey - is a perennial flowering plant of the genus Symphytum in the family Boraginaceae native to Europe and widely introduced elsewhere, now sometimes a weed. It is a hardy plant growing to 1.3 m (4 ft) tall with hairy broad leaves and small bell-shaped flowers of various colours, typically cream or purplish, which may be striped. Sow in the spring or summer, preferably in a nursery, with 4 to 5 seeds per hole. Easily cultivated, the comfrey once installed - in 2 or 3 years - does not fear much. Make sure it has sufficient watering and you can also bring nitrogen matters like manure of nettles. It likes wet and deep lands because its roots can reach down to 1.50 m! Thin on emergence, keeping only the most vigorous plants. Replant the next spring at the final location with 50 cm between each plant. Choose the spot with care, because with its deep roots, it is very difficult to move the comfrey! Water thoroughly for the first few weeks after planting - then keep an eye on it for the first year, not letting the soil getting too dry... then you'll just have to leave it alone - it will manage very well on its own. The planting of seedlings purchased in buckets can take place from October to spring: plant in moist and deep soil, every 0.50 to 0.70 m.
Mulch early in the season, so that it always keep wet and cool roots. Look after her! 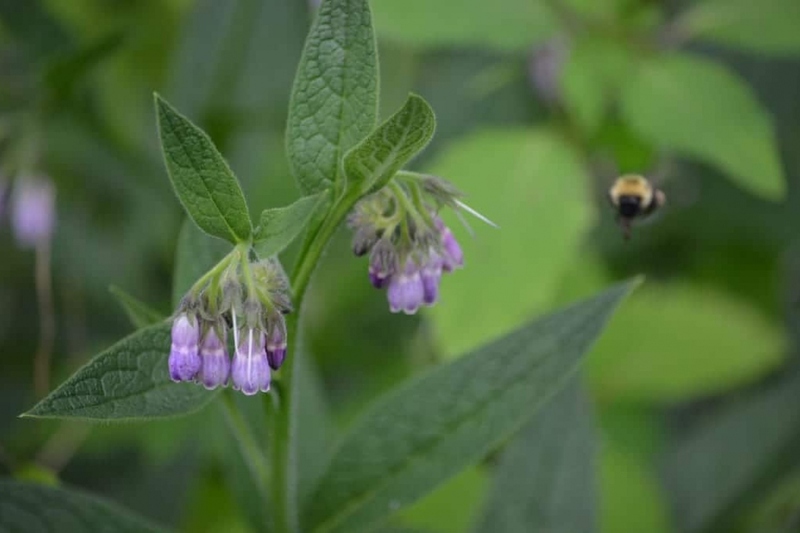 In case of dry spring, comfrey can be prone to flea beetle attacks. Mulch it to prevent this plague and in case of invasion, do not hesitate to use diluted nettle manure.